ACT Ohio’s central goal – and that of our 14,000+ signatory contractors – is to ensure the safety of our more than 92,000 professionally trained construction workers. 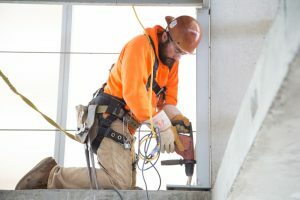 A study completed by researchers at Bowling Green University, Kent State University, Colorado State University found that our Building Trades affiliates spent over $48 million on apprenticeship and safety training in 2015 alone. ACT Ohio affiliates safeguard members by providing Occupational Safety and Health Administration (OSHA) training to prevent job site accidents and injuries. Reducing injuries results in fewer work stoppages and lower costs (including workers’ compensation premiums), saving Ohio contractors and project owners money. A drug-free workforce is also central to the Building Trades’ safety training. Affiliate collective bargaining agreements require that 100% of ACT Ohio’s more than 92,000 skilled craftspeople are subject to random, mandatory drug testing, in addition to annual mandatory testing. • A measurable reduction in the direct costs associated with illness, injuries and fatalities, such as medical expenses, workers’ compensation payments and increased premiums, additional insurance claims and lost time on the job. • Lower indirect costs, including training and compensation for replacement workers, repair of damaged property, accident investigation and implementation of corrective action, schedule delays and additional administrative time. • A more positive workplace culture and improved employee morale due to the enhancement of workplace safety and health, resulting in higher productivity and quality, reduced turnover and greater worker satisfaction. • Improved perceptions and reputation among customers, business partners and investors as a result of a proactive approach to the safety and health of employees. A Building Trades workforce lowers costs, reduces accidents, and increases productivity – all factors which make for good business.